The pipeline transporting Russian gas to Armenia through Georgia was damaged by an avalanche in the Georgian mountainous Dushet district. Lately Armenia has been getting 1/3 of its usual supplies through a bypass pipeline, while the rest was coming from underground storage facilities. Russian gas monopoly Gazprom urged Georgians to do their best to repair the pipeline as soon as possible, as it supplies up to 10 million cubic metres of gas a day to Armenia during the peak winter season. “Armenya is now experiencing a shortage of up to three and a half million cubic metres of gas,” says Ashot Ovsepyan of ArmRosgazprom. The rupture of the pipeline has also attracted attention to relations between Gazprom and its foreign customers. The monopoly insists on new gas tariffs as part of its efforts to end a system of subsidies to ex-Soviet republics and switch to market prices. Russia has told Georgia to pay $US 230 per 1,000 cubic metres of gas, up from the current $UD 110, and threatened to halt supplies since next month if no deal is reached. 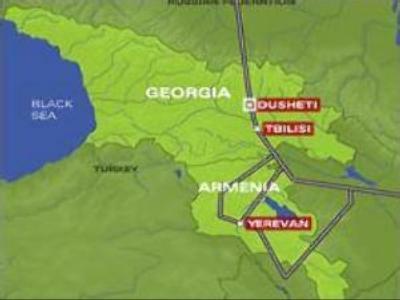 Tbilisi has also negotiated connecting pipelines running from Azerbaijan, Iran and Turkey. Georgia's former Soviet neighbour Azerbaijan has also promised to help Tbilisi to avoid any energy shortages by supplying more gas from its new Caspian Sea deposits. But so far Georgia is largely dependant on Russian gas, and the price is still being negotiated. Gas analysts say, if Russia has to resort to the most radical steps and halt its gas supplies to Georgia, that may also put the flows to Armenia at risk.